Mardons Sports & Social Club of Midsomer Norton - Directions for locating the club. For both drivers and walkers. We are situated just outside of Bath, in the Radstock area. We are between Westfield and Midsomer Norton, on Norton Hill, in a quiet tucked away location. • We are still tricky find - we look like part of the housing estate. As you follow the main road all the way through the Nightingale Estale (Nightingale Way) which is opposite Norton Hill School, you come to the new part of the development. On your left there will be a green public area, a sat nav should get you to this point, beyond the green is the social club, you should be able to see us. Take a look at the video to follow the route from Charlton Road to our front door. Check out the parking information below. • There is also access to the club through via the Old Pit Road (generally known as Coate's Road) which can be accessed from the main A367 Fosse Way or by Longfellow Road via Keats Road. To park, from the start of the new part of the estate, you can either turn immediately left and park in our allocated spaces which are in front of the nursery. Alternatively, cotinue past the first row of houses on the left, at their rear is a side road called Mardons Close (it's easy to miss) - that will take you to our car park and front door. 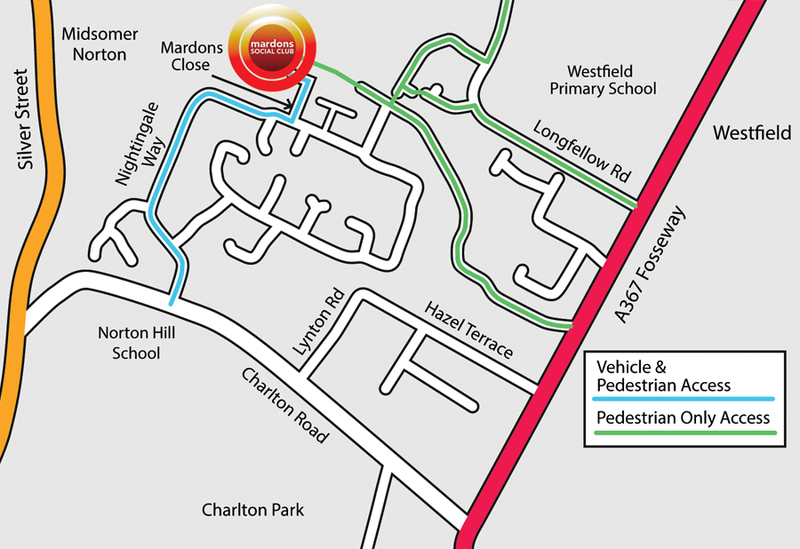 Please take note of the parking spaces allocated to us (coloured red and gold) when you visit Mardons. 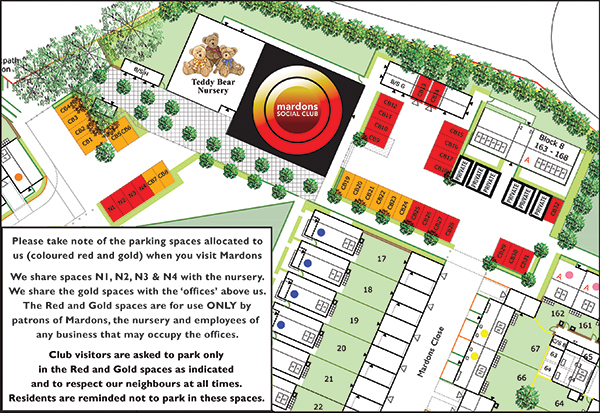 Club visitors are asked to park only in the Red and Gold spaces as indicated and to respect our neighbours at all times. If you find yourself having to park on the estate, please do not obstruct any access, do not double park in narrow roads and always park carefully and with consideration for our neighbours. Please do not park on the spaces marked as 'PRIVATE', these belong to residents.